The UN Department of Economic and Social Affairs has estimated that by 2050, the world’s population will reach about 9.8 billion – nearly 70% of whom will live in cities. And the cities are what we need to focus on to reach the goals of the Paris agreement, which sets out a framework to keep global warming below 2 degrees Celsius. Our cities are the main drivers of the world’s economic output, but they are also massive consumers and account for 60-80% of energy consumption and 75% of carbon emissions. Urban efficiency is the most effective way to turn the challenges of our cities into opportunities. We have the technologies to harvest the benefits of urbanization, and this site offers an insight into already implemented solutions – getting more, while using less. Approximately 200,000 new urban dwellers every day. In 1950 two-thirds lived in rural areas. 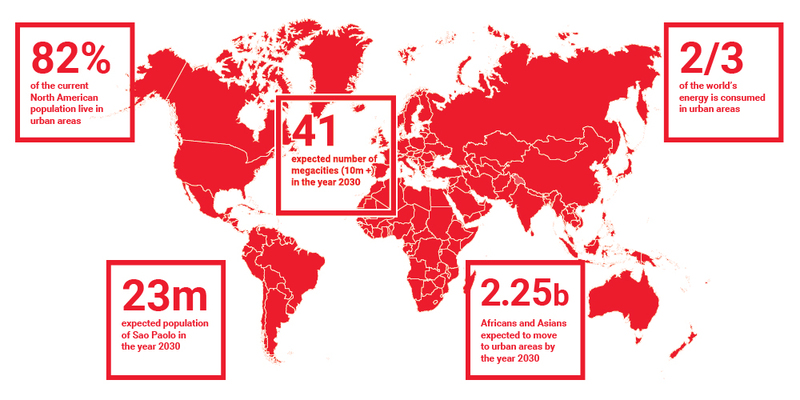 By 2050, two-thirds will live in cities. Buildings account for 40% of the total energy consumption. FRANCE: A new heating network makes the French city Nantes capable of reducing 17,000 tons of CO² per year. The project takes place in several steps and includes schools, administrative buildings, a nursery and 7,400 residential apartments. EUROPE: Students are amongst the first to experience the challenges of finding a place to live in an undersupplied market. In fact, rising urbanization in Europe’s major cities will leave a projected shortfall of more than four million beds by 2025. DENMARK: Scandinavia’s biggest urban development project is rising in Copenhagen. It’s a lab for future smart energy technologies and an opportunity for Danfoss to demonstrate the art of intelligent and climate-friendly heating and cooling. GERMANY: A whole new city quarter, HafenCity, has been built in the heart of Hamburg. It is currently Europe’s largest inner-city development project, and it is setting green standards as city planners have chosen the most sustainable and economically advantageous solutions with Danfoss technologies. POLAND: The city of Słupsk and Danfoss have signed an agreement to build a vision for the city as smart and highly energy-efficient. CHINA: A few years ago, Benxi was suffocating in smog. Today, the capital of Chinese steel industry can breathe again. Implementing a district heating system will reduce the annual coal use by 198,000 tons. DENMARK: Denmark aims to be the first country in the world with a carbon-neutral water utility sector. Over the last five years, energy consumption in the Danish water utility sector has plummeted by 20% - and the Danes have now even managed to create the first energy-neutral catchment area in the world. GLOBAL: Data centers currently use nearly 3% of the world’s electricity - as much as Great Britain - and emit as much CO2 as all the world’s airlines combined. We have the technology to cut down data centers’ electricity consumption and use their surplus heat for heating homes. Stay up to date with recent information from Danfoss, get inspiring content and find the latest events. Read successful case studies from our customers and explore how we can help you engineer a better tomorrow.